Cafe Liz is going kosher for Passover: I’ve cleaned the kitchen and thrown out last year’s matzo. Oh, and I’ve also gone through all my recipes, and pulled out the ones that suit the holiday, based on both Ashkenazi and Sephardi traditions. If you keep Sephardi Passover like my family, you’re probably used to a vibrant, vegetable- and rice-filled Passover (I’m thanking my Turkish and Greek ancestors as we speak). In fact, I usually find that I have more things to eat over Passover, not less, because I cook more. Since the only things off-limit are wheat, spelt, barley, oats and rye, all the rice noodle and bean-thread dishes are perfectly fine, as well as everything with tofu, bean soups and, of course, rice. Just double-check that your soy sauce doesn’t contain wheat (look for something gluten-free, and read the label). If you go by Ashkenazi traditions, well, things look a little more bleak. Aside from the five key grains, Ashkenazim also forgo kitniyot, which include rice, corn, soy beans, string beans, peas, lentils, peanuts, mustard, sesame seeds and poppy seeds. But don’t despair, I’ve found that a good number of my recipes would work even for the strictest adherents. If you eat kitniyot derivatives, then you can go through the list of Sephardi kosher recipes, and thus increase your options. Also, there’s been a debate about whether the kitniyot ban should even apply, in Israel and in general. But that’s another matter. Many of the recipes that I didn’t include in the above lists could be altered to make them kosher for Passover (like many recipes), but I left them out to avoid confusion. Obviously, if I’ve mislabeled anything, please let me know. P.S. In response to some queries I got over Google: People frequently find my site when asking “Is ___ kosher for Passover?” I’ll try to provide some responses. No, tabouleh is not kosher for Passover because it contains cracked wheat that is exposed to water. You could leave the wheat out, though, and then it would be kosher for Passover. Tempeh is kosher for Passover if you follow Sephardi traditions — it’s made from fermented soybeans, a form of kitniyot. Seaweed — no reason it shouldn’t be kosher for passover. It’s a vegetable, and not a legume. Rice noodles — only if you keep Sephardi passover. Rice isn’t hametz, but it is a form of kitniyot. Azuki beans, kidney beans, green beans — they’re all kitniyot. In general, Chabad has a very detailed article about what constitutes kitniyot. It’s not very straightforward. Also of use may be the OU article on kitniyot, and the Star-K article on kitniyot. You’ll notice there are discrepancies. 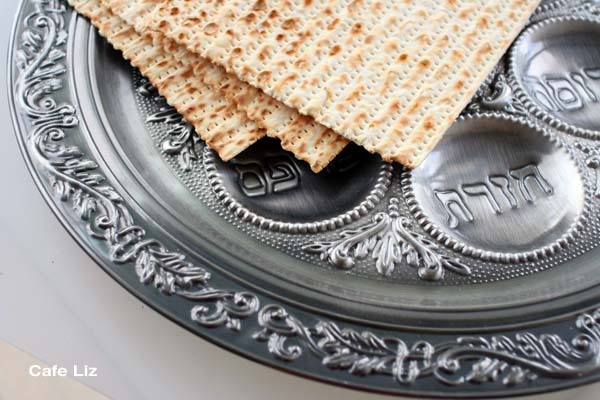 3 Responses to "Cafe Liz goes kosher for Passover"
hi liz, i came across your blog while looking for sephardi passover recipes 🙂 love it! love your photos too. 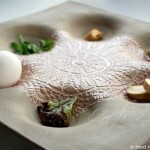 i am very picky about food blogs and am delighted to have stumbled upon yours. chag sameach! Thanks so much! 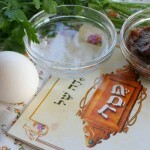 I’ll be posting real Sephardi recipes later this week (not just Sephardi style). Chag sameach!